The Dutch word guur (harsh) perfectly describes the conditions as we head off the busy motorway on to a quiet country road, icy winds whipping heavy flurries of snowflakes around us. Cutting through the stark winter polder landscape along dark rows of the typical pollarded willow trees, we reach our destination, the village of Zuid Beijerland, home to Astrid Apon. As we are welcomed into her beautiful – warm! – red brick house on the dyke, several seasonal green wreaths and the sculptural umbels of an enormous sprig of dried hogweed catch the eye – simple, yet bold and striking. Astrid’s feeling for the essence of the materials she creates with shines out in her work. Astrid makes in a variety of settings. 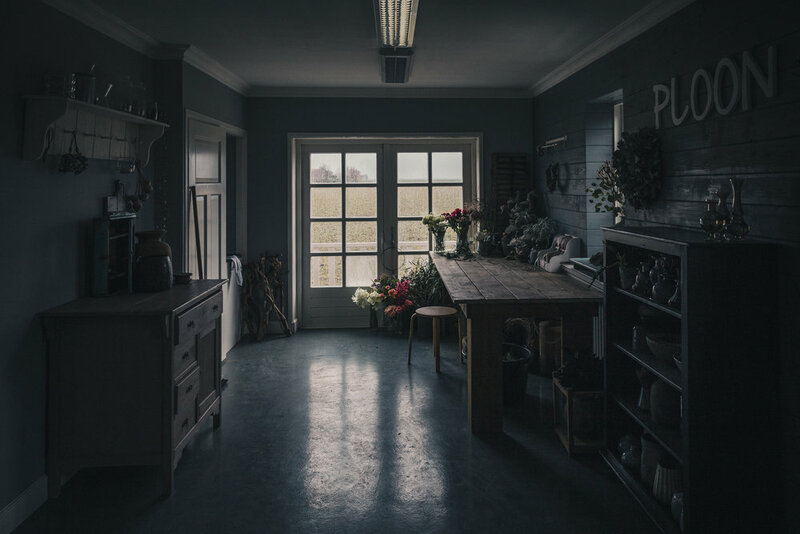 In the intimacy of her own studio Ploon, a workspace leading off the kitchen and veranda of her house, french doors framing views of the surrounding landscape, she creates highly personal arrangements for family occasions and running workshops on the premises. Additionally, she works at the unique in-house Floral Boutique at Hotel The Grand, Amsterdam, and, as if that wasn’t enough, is regularly called in to assist the top team of floral decorators to the Dutch Royal Family. Throughout the interview, we explore the origins of her making, and her deep personal connection to her creations. Working here from my studio at home, I work on individual commissions, designing and making flower arrangements for funerals and bridal decorations. They are very personal pieces. The client’s taste is key and I incorporate specific requests, favourite flowers for instance. But they generally know and appreciate my style – natural, simple and quite wild. Based at the studio, I also run flower arranging and wreath making workshops for groups, which have become very popular. I work at Hotel The Grand in Amsterdam, several days a week at the in-house Floral Boutique. We cover all floristry needs of the hotel, events and guest rooms, and often produce large-scale pieces for events in public buildings such as the fabulous Rijksmuseum. I’m also regularly called in to support the floral decorators to the Dutch Royal Family. The work at the palaces never ceases to inspire me. We get to work with top quality materials and I really love the team. It’s like a glimpse into another world. I’ve always really enjoyed making things by hand and flowers are so beautiful. Although I’ve always enjoyed them, I haven’t been working with flowers all my life. I spent 15 years working in an office, but I always took one day a week off to do something I loved – and it was always something creative. I experimented a lot – my way off letting off steam, I think. I loved the time to myself, switching off and making beautiful things. My mother used to buy flowers on the market every Saturday and bring them home, asking me to turn them into a bouquet. So, when I was little, I was always arranging flowers and it became something I always did. Later on, my husband had his own business and I had to take time out to look after the kids and my mother after she became very ill. Then, after my mother had passed away and the children had grown up a bit, I decided that I was going to do something I really loved. I started a four-year evening course in floristry. Afterwards, I found the job in Amsterdam and started my own business Ploon. Thailand. I don’t think that has anything to do with flowers in particular. 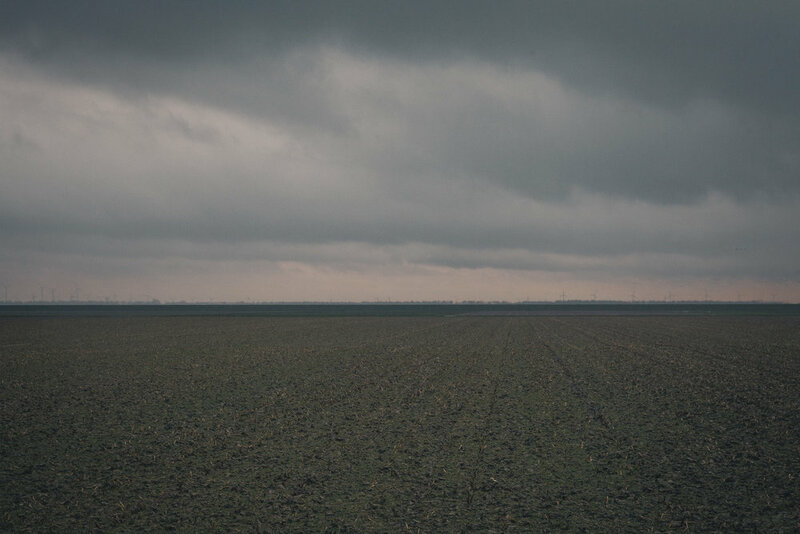 It’s more about nature itself – the countryside. I love going out wherever I happen to be. That’s what I enjoy most of all. Even just taking the dog for a walk, I love the way it soothes and energises me. I had been on several backpacking trips to Southeast Asia when I was younger and last year we took the kids. I can’t explain it, but it feels like coming home. My husband and I even seriously considered moving out there, but there were too many obstacles. But I always love going back. If I close my eyes I imagine myself sitting by a temple - in a place like Ayutthaya. But simply stepping outside onto the street, there is always someone selling delicious food, ready for a friendly chat. I love the outdoor life there. The warm weather helps, I suppose. I also love walking around cities, soaking up everything there is to see. The colours and textures never fail to inspire me. I’m a very visual person. I think I take everything in subconsciously and it informs my work. I’m always looking. When the weather is warm, I love my veranda. It’s a very relaxing spot with great sweeping views right outside my studio. I love the contrast of the large-scale work in the imposing museums and beautiful historic palaces with my own, very personal, calm space – my studio here at home, where I work on commissions for individual customers. I always come home full of fresh ideas. Here, at home, my favourite place is here at my workbench, rummaging around and working on commissions, mostly for local families. Usually, particularly for funeral arrangements, I pay the family a visit in their own surroundings and ask some questions about the deceased; whether they had any favourite flowers in particular and suggest some combinations and styles. It is always a delicate matter, quite nerve-wracking, every single time. Every one has to be spot on. It’s something you can really do to help a family with their loss. Flowers can really provide comfort. Usually I know the family quite well, as I live in a small village. The intimate surroundings of my own studio, out here in the countryside, help bring on the calm, meditative state of mind I need for funeral work. It’s very important to me to center my thoughts on the family and the deceased when I am creating those very special, personal pieces. A nickname for my place? “Mijn hok!” (laughs) Officially it’s called the studio, but I always say “my shed”, nice and simple. I love barricading myself in my “shed” to get making. What philosophy informs your work? My philosophy is to keep things simple. Bold and clear – no fiddly pearls – flowers don’t need adding to. Simplicity is key. That’s how you appreciate the beauty of each and every flower, with no distractions. It would be a waste of materials as every flower is perfect as it is and cannot be improved. No need to add anything, just combine, not re-create. I see myself as someone who uses the essence. My mother taught me to notice the essence very early on in life, and to recognise the beauty of a single daisy or blade of grass. I appreciate them just as much as an elegant rose. I am guided by my experience and intuition – ideas surface and I get busy. Usually I see a particular flower at the flower auction and I think “ooh, that’s the one.” Then I gather two or three more varieties and then any the other materials I feel will work. Things just seem to evolve – I get into the flow and sometimes surprise myself with the result. It doesn’t have to be that difficult. It’s a natural process. Which are the places in your past that made you? When, some years ago now, I was wondering what I really wanted to do with my life, I discovered that I really wanted to do something involving floristry. Thinking about how it came about – that must go way back to the time, when, every Wednesday, my mother took me to my grandma’s house on the back of the bike. We cycled along the narrow country tracks along the polders and had to jump into the ditches every time we met a tractor. So we stopped a lot, my mother spotted the plants growing there and pointed them out to me. We always ended up picking a fresh bunch of wild flowers for my grandma. My family lived in a flat on the third floor, but those little trips, as well as the flowers my mother brought home from the market for me to arrange every Saturday, really inspired me. My mother said, “you’re better at it than me, so you do it”. My grandma gave me a piece of her garden and bulbs and seeds to grow my own flowers and generally do whatever I liked. So I was always busy with gardening and flowers. I think my mother was my greatest inspiration growing up. Sadly, she died of early onset Alzheimer’s at the age of 65. So we all had some very difficult years. And it was only after she had passed away that I started my floristry course, so she never knew that I went on to do this. Later, I started my own business and I needed a name, and that was hers. Ploon. Everyone called her Ploon, but her real name was Plonie, an old traditional Dutch name.It just sounds perfect for my business. People coming to take part in workshops often ask where the name came from and I end up talking about her a lot, which is always lovely. Which place do makers occupy in the world? An important one. But they may not see that so themselves. They are often insecure about what they make. But makers are so important, just look around you, from the pictures on the walls, the furniture we use, everything is made by humans. It’s what makes you human. In our rich societies, we are privileged to have the materials, the time and the energy to create. And your surroundings inform what you do. To me, it is so normal. It really is nothing out of the ordinary to me. What was special is that my mother saw the beauty in what is described as weeds and wild flowers. I think it is good for everyone to do something creative, be it drawing, making, painting, just to let off steam. It feels great when you’ve made something and “Wow, it’s done and it has worked out”. And you have created something meaningful for someone else. I wish people would accept others as they are. Show more empathy towards each other. That’s all. All the moaning about people having to fit in, about them not being good enough. A bit more tolerance would make all the difference. I have to say, looking at my teenagers and their friends makes me hopeful for the future. They are positive, open and accepting. It really seems to be mainly members of the older generation who are trapped in their prejudices. Astrid’s studio annexe is a snug one-room affair leading off the kitchen of her typical Dutch family home. 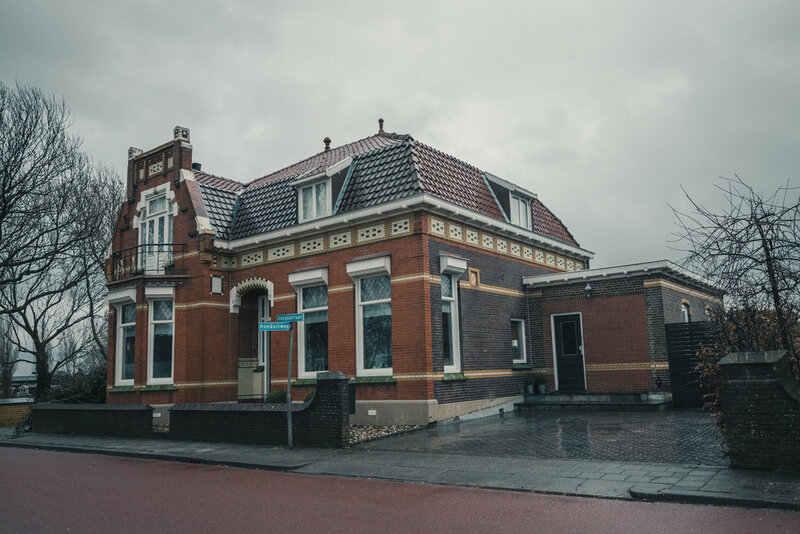 Built in 1914, the house is positioned upon one of the region’s centuries-old dykes running through the village of Zuid Beijerland, only a short hop from the vibrant port city of Rotterdam. 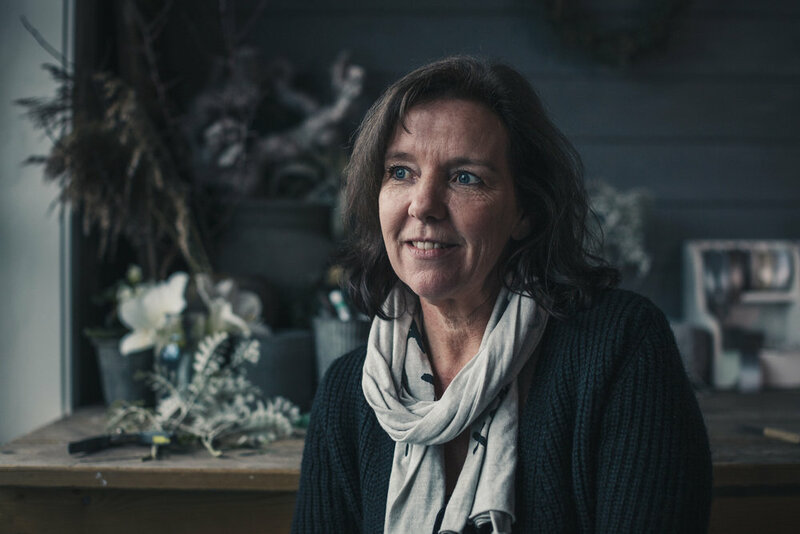 Here, Astrid escapes the hubbub of the cities and finds the peace and quiet she so enjoys, perfect for slowing down and immersing herself completely in the meditative processes involved in her studio-based floristry work. 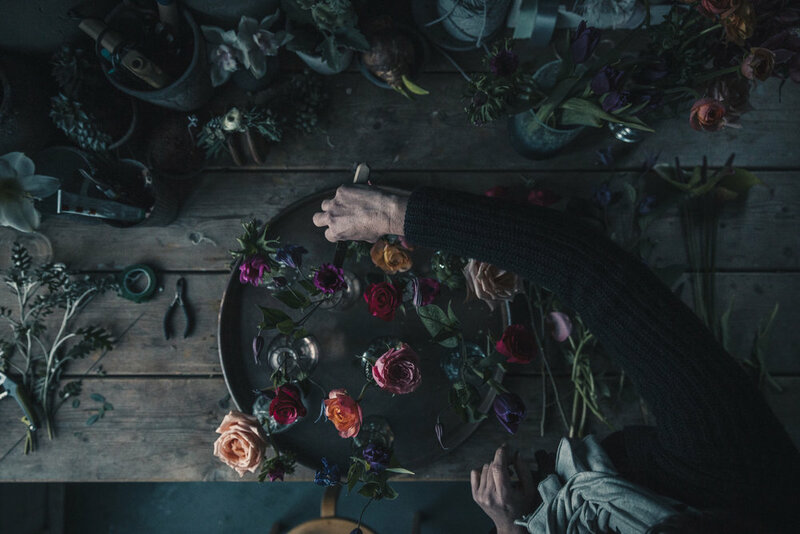 The workbench forms the centrepiece of the studio – tools, ribbons and the natural materials Astrid uses in her creations strewn over its surface. 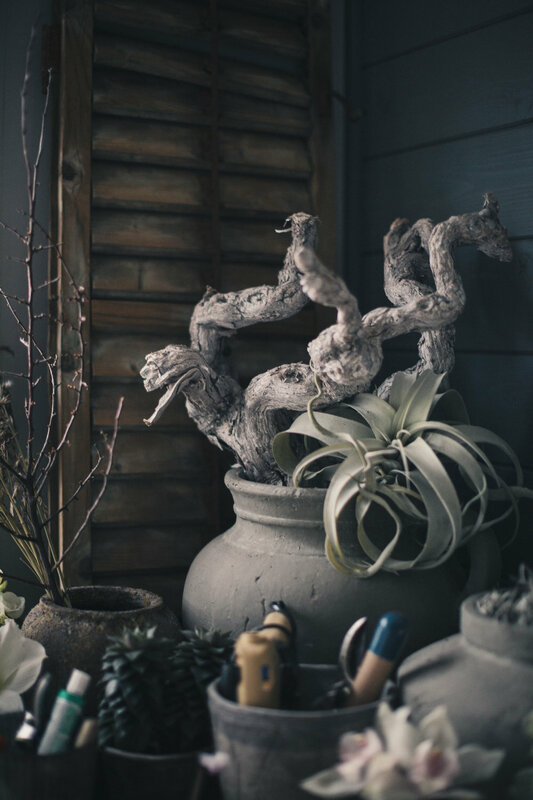 Beside it, in perfect harmony with the dark monochrome colours of the studio walls, an old grey bookcase presents an array of gorgeous vases and pots, in itself a still-life reminiscent of the intricate masterpieces of the Dutch Golden Age. 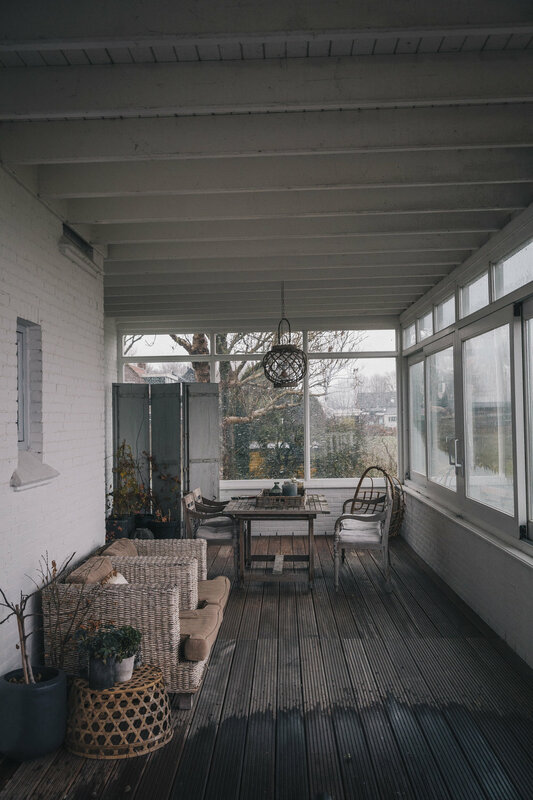 The french windows of the studio offer an ever-changing living painting with their big-sky view of the polder landscape of the region – the countryside providing endless inspiration during Astrid’s regular rambles with her dog Soof. This photo of my mother is very dear to me, a very old one. My daughter once said to me “Mum, your hair looks different in this photo” – she was pointing at my mother! We look so alike. Wreaths are something that I really enjoy making. I like them bold and pure. Sometimes I make them purely for my own enjoyment, sometimes for my friend’s interiors shop. I actually prefer a good wreath to a framed painting. It’s a relaxing process whenever I have a spare moment. I don’t need to think, just let my hands do the making. This one is woven from wild asparagus. It’s very strong, great for weaving. I’ve had this little one from the very beginning, when I bought it specially for my course. It’s really old now, but my husband keeps it sharpened and I still love using it. It just belongs here with me on my workbench. Craftswoman. The girl who always wears flowers in her hair talks to us about weaving with sustainable materials in Bali, the beauty of mistakes and why craft softens edges.